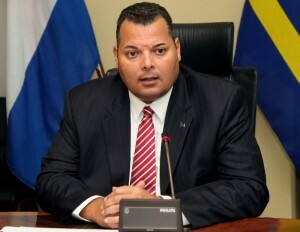 WILLEMSTAD - During the weekly press conference of the Council of Ministers, Prime Minister Ivar Asjes announced that on May 5, 2014, the government will observe this day on which the late political leader, Helmin Wiels was assassinated. The government will also rename the EEG weg, which runs from the roundabout at Julianadorp till the water plant Aqualectra, as the Helmin Magno Wiels Boulevard. This will take place on the same date. “We will honor Wiels by giving this street his name,” Asjes said. “We have also asked Reda Sosial, to build a sports park in Steenmijn, which was Helmin Wiels’ neighborhood. We will call this park the Sports and Recreation Plaza Helmin Magno Wiels. We will inaugurate this plaza on May 4. Reda Sosial has been building and renovating sport complexes in various neighborhoods. The Prime Minister voiced his desire to this organization to give the sports park in Steenmijn the name of the former Pueblo Soberano leader. This decision was made since last year December. The sport complex in Gibraltar will also be renamed as Helmin Wiels sport complex. “The government is certainly honoring the late political leader and Member of Parliament, who did so much for the people of Curacao,” the Prime Minister said.